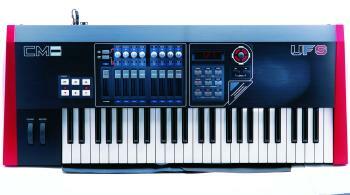 Following the launch of the UF master keyboard series in early 2005, manufacturer CME launched the first hardware plug-in module for its line of versatile MIDI keyboards. Adding IEEE1394 audio firewire functionality to all of the UF models, the UF400e is a hardware plug-in expansion board providing two high quality 24bit/192kHz line inputs, two high quality 24bit/192kHz line outputs, microphone input with professional preamp, S/PDIF digital I/O, two headphone outputs with volume control, and a complete MIDI interface featuring In, Out and Thru. The UF400e FireWire Board can be fitted in place of the blanking panel that can be found on the back of each UF Series model. The UF master keyboard range comprises UF-5 (49 keys), UF-6 (61 keys), UF-7 (76 keys) and UF-8 (88 keys). Flagship model UF-8 offers hammer action weighted keys while the other versions come with a semi-weighted keyboard. All of the UF-line's instruments feature a durable aluminum housing, aftertouch, breath controller option, and many hardware controllers such as eight knobs, nine sliders, pitchbend wheel and modulation wheel. The control buttons REC, PLAY, REW can remotely control your sequencer software in your computer directly.